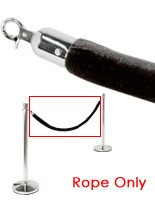 Who hasn't noticed how stanchion ropes bring a sense of style and elegance to any location or event? This type of barricades are more than simply the classic brass and red velvet combination seen so often at high class events. 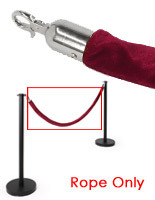 High visibility stanchion ropes, frequently called event barrier cords, are one of the most economical ways to instantly update crowd management systems. 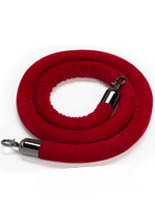 Our selection of in-stock economy post accessories includes a range of rich tones in velvet, velour, and braided nylon to match any décor or color scheme. 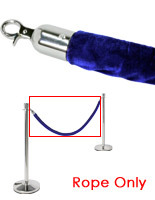 Fabric stanchion ropes, like retractable belts, are effective in almost any public environment. 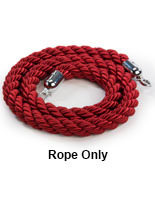 From simple, heavy duty braided nylon cords delineating different cashier lines in a bank to plain black velour barricades separating theater entrance and exit areas to classic red barriers roping off a VIP area in a restaurant or club, these queue post accessories are perfect for alerting crowds or customers to expected foot traffic patterns. Durable construction with a variety of end-cap clip finishes allows the roping to complement or contrast with pole and post finishes as desired. Whether replacing older lines or updating the look of a facility for a particular event, these economical barriers are perfect for any business. What are the different event barrier options? 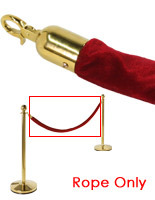 Velvet stanchion ropes represent the gold standard for high quality special events. 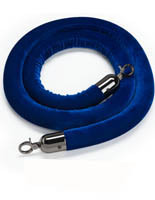 These 6.5' long accessories have a plush foam core covered in soft napped velour fabric. Rich, deep colors like burgundy, maroon, blue, and black are balanced by sturdy metal clasps in complementary finishes. The red style in particular is virtually synonymous with VIP sections or high end events. 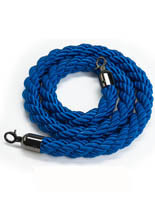 Braided nylon lines have a more modern and less formal look than fabric. These durable units give commercial and professional locations a more personal feel than standard retractable belts, while still providing queue management and security. The sturdy dividers come in a selection of colors ranging from neutral to bold shades to match or stand out from decor as needed. 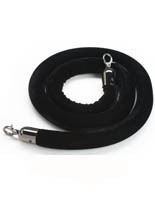 Nylon and fabric models feature metal hook clasps at each end. Designed to complement standard stanchion pole finishes, the easy-open clips are available in gold, mirrored chrome, silver, and classic brass finish colors. Matching or complementary accessories are important details that can add value to overall satisfaction in commercial business operations or at special events. Lines for queue management systems are much more than simply decorative crowd control ropes. Twined and braided cords are ideal equipment for creating clear queuing areas in banks, museums, restaurants, ticket offices and other commercial or professional waiting areas. 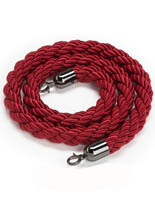 Customers associate a certain sense of style with draped roping that is very different from standard retractable belts. 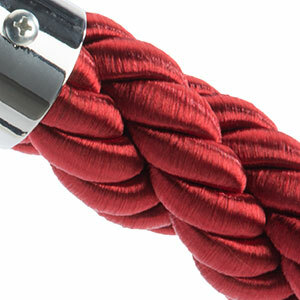 Classic red velvet ropes are an economical way to evoke an atmosphere of style and luxuriousness in any environment. Low price barriers are ideal for creating adaptable crowd control systems in high volume, heavy traffic areas. Units can be matched to corporate or facility décor and brand colors, or swapped out to create high contrast queuing areas for special events. These colorful queue post accessories can help make every customer experience a positive one. Our selection of professional grade cords for poles will fit any crowd control need, whether directing foot traffic, viewing a museum exhibit, sitting in a VIP section, or waiting in line for customer service.